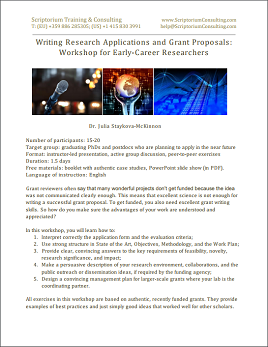 Download a PDF about workshops in grant writing. Our workshops are suitable for early- to mid-career researchers in life sciences, technology, and engineering. We offer workshops in general grant-writing skills, as well as facilitation sessions that focus on a concrete funding instrument in a national or EU agency: e.g. ERC PoC, FWO-EOS, MSCA-ITN. Our workshops are based on authentic case studies from successful recent grants. Participants receive all training materials for free. The workshops we design for doctoral schools can be field-specific (e.g. for life sciences only) or open to a wider doctoral population that includes sciences, technology, and social sciences. Workshops for mixed groups use materials that draw on the different fields of expertise represented in the audience. Interpret correctly the application form and evaluation criteria of your agency. Use strong structure in State of the Art, Objectives, Methodology, and Work Programme sections. Provide clear, convincing answers to the key requirements of feasibility, novelty, research significance, and potential impact. Make a persuasive description of your research environment, collaborations, and the public outreach, dissemination, and valorisation ideas, if required by the funding agency. Write a project management plan that avoids the common traps. Learn what to expect from the oral interview with a funding agency, how to prepare, and how to interact with your reviewers.